The best methods for memoQ desktop editions to work with other memoQ users are influenced by the versions of the software you and others use. If these versions are compatible, project information can be shared fully, including previews and status settings for the translation. Otherwise, many of the compromises of working with other translation environments apply. Bilingual exchange files are generated via Project home > Translations > Export bilingual. If the other person also uses memoQ 6, the best and "friendliest" option is to create a memoQ XLIFF and include the skeleton and preview. The "skeleton" allows target files to be created. 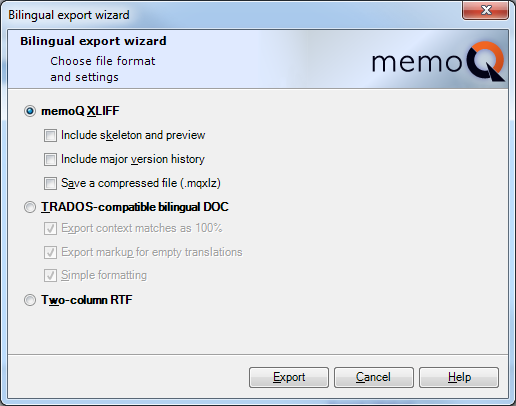 For earlier versions of memoQ, a simple XLIFF with the extension changed to XLF or one of the other bilingual formats will do. In memoQ 6, bilinguals are imported using the Import command (and are recognized automatically); in earlier versions, the Import/update bilingual command is used. The tags will always be respected. If the bilingual DOC format is used for exchange, the finished work must be exported via Export bilingual. Other export commands produce monolingual target documents. The least complicated format to use for users of memo 4.2 to 5.0 is the two-column RTF. Version 6 TMs and termbases are fully compatible with Version 5 of memoQ, and data can be exchanged with all versions via TMX and delimited formats. A fully configured project with all settings, translation files, TMs, termbases and corpora can be sent by creating a backup. On the memoQ Dashboard, select the project and click Backup selected. Warning: backup files can be very large, so you might want to detach very big TMs first, for example. And of course this requires the same version of memoQ to be used. If translations have been assigned by name in Project home > Translations, handoff packages for translators and reviewers, including necessary resources, can be created after running a check on Project home > Overview > General > Handoff checks.This, too, requires the same version of memoQ. Another point to consider: memoQ versions 5 and 6 can co-exist on the same desktop computer, so if you need to continue working with clients who have the version 5 server, for example, there is little to stand in the way of upgrading to version 6. The only real difficulty might arise if you want to attach corpora you have migrated; this may require restoring the LiveDocs corpora from the backup of the old version or creating a new one.